Sam Kettle (Jones) is tired of being an L.A. cop on the edge, so he and his wife Sara (Blair) decide to move to Colorado. But before he can escape, he’s called back in for “one last mission”. It seems a criminal mastermind named Kendrick (Vintas of Zero Tolerance fame), who is an “Ex-C.I.A. turned psychotic”, and his apprentice, Amy (Ferratti), have kidnapped elderly biochemist Dr. Terence London (Erwin), and a six-year-old girl as well. Seeing as Kendrick was responsible for the death of Kettle’s old partner, now he wants to settle the score. Coming along for the ride is Jun Kim (Chong), uncle of the kidnapped girl, and Bernard (Rhee), owner of a Kendo studio. But to achieve their goal won’t be easy, as they have to face off against not just regular ninjas, but ninjas with axes (or, “Ninjaxes”). Will the trio be able to fight to the finish? And what does a stuffed Heathcliff doll have to do with all this? From the opening credit informing us that this is an “Action Brother Production, Inc.”, you know you are in for something good. Silent Assassins is a fast-paced and entertaining romp with some familiar faces, and the movie is easy to enjoy. Sam Jones is the ultimate 80’s coolguy, with his sunglasses, jeep, bomber jacket, spiky brushcut hairdo and unshaven face. He’s truly as cool as the metal his last name in the movie is obviously made of. In the big-budget remake they’ll surely get Bruce Willis to replace him. But Mako is onboard as well. We love seeing him, but he’s still unintelligible. Yet another fan favorite, Phillip Rhee rounds out the cast of heroes and right there you know you have something worth seeing. Unfortunately, Linda Blair plays a cliched “wife” role and doesn’t live up to the image on the box cover. That could have added a new dimension to this movie, but sadly it wasn’t to be. But that’s one of the few negatives here - there’s plenty of high-kicking action, not to mention the damage incurred by the Ninjaxes, which include dismemberments and fan-favorite death, decapitation. There’s even a possible exploding helicopter for fans of that, as well. Bill Erwin, who fans of Seinfeld may remember as the old guy with the large record collection that Kramer and Newman try to resell, shows us all that if you want to blow up a computer, just turn the keyboard over so the keys are facing down. The kidnapped senior citizen plotline is very reminiscent of the previous year’s Survival Game (1987), where the older man in question was played by Seymour Cassel. Kidnapping the elderly to find out their secrets must have been a popular idea in ‘87-88. 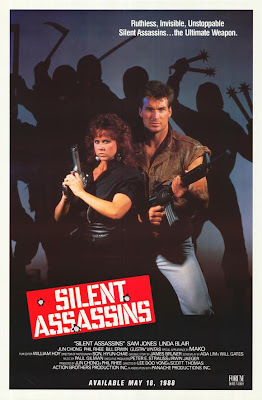 Silent Assassins delivers the Golden-Age-of-the-video-store-style action goods and achieves a lot of entertainment for its modest budget. We liked it. Great stuff! I just watched Maximum Force, and was looking for what my next Sam Jones should be. This looks like it's it! Thanks! Looking forward to reading your write-up. This is a perfect Sam Jones vehicle. Linda Blair sure does tar in some interesting films, she was also good in Moving Target, Savage Streets, Nightforce, Red Heat, SFX Retaliator, Savage Island, Bail Out and Prey Of The Jaguar. Great review! Silent Assassins and Fist of Honor were Sam Jones's best movies. It's a shame he never got more leading roles. Venom: Agreed. We enjoyed Savage Streets and Nightforce (Reviews coming soon) Always wanted to see SFX Retaliator! Roger: Thanks! He really should of gotten more roles...it's a shame...but at least he was in a couple fun ones: Fist Of Honor, Maximum Force and this one. Just bought a copy of SFX Retaliator off Ioffer. That's awesome you just bought it! Thanks for the links.